Toronto – September 20, 2018 – The deadline for the 2018 UFCW Canada – BDM Scholarships is rapidly approaching. Don’t miss your chance to win one of 18 $1,000 scholarships, which are awarded annually to active members and their family for post-secondary study. 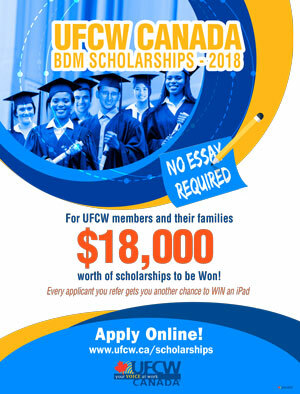 Applying for a UFCW Canada – BDM Scholarship is easy. You don’t have to be an A+ student or write an essay. All it requires is a passion for learning, enrollment at a post-secondary institution, and a few minutes of your time to complete the online application. In addition to the BDM Scholarships, more than 25 union scholarships, totalling more than $300,000, are available to UFCW Canada members and families every year. The deadline for the scholarship application and contest is September 30, 2018. Don't miss this amazing opportunity to win!